buy generic Seroquel online ordering cytotec online Darrell Samuel Cole was born on July 20, 1920 in Esther, Missouri, today part of Park Hills. He graduated from high school in 1938 and was both an athlete and a musician. Cole joined the New Deal-era Civilian Conservation Corps, spending a year with them before leaving for a job in industry. That didn’t work out either in the long run, and Cole joined the United States Marine Corps Reserve on August 25, 1941. After recruit training, Cole’s musical background saw him sent to field musician school for training as a bugler. He repeatedly petitioned his chain-of-command for transfer to a combat billet, but was denied due to there being a bugler shortage. Regardless, Cole grabbed every opportunity under fire to volunteer as a rifleman or machine gunner. He served with courage and distinction during the United States Marine Corps‘ campaigns on Guadalcanal, Kwajalein, Saipan, and Tinian. In November 1944, Cole once again requested to be relieved of his duties as a field musician and assigned to a direct combat role, pointing to his already long combat service record as justification. This time, his request bore fruit. He was promoted to Sergeant, and placed as the leader of a machine gun squad in Company B, 1st Battalion, 23rd Marine Regiment, 4th Marine Division. Seventy years ago today on February 19, 1945, Cole and his squad landed on Iwo Jima with the earliest assault troops. As he and his Marines advanced towards their objective of one of Iwo Jima’s airfields, Cole’s incredible personal courage, fighting spirit, and leadership routed the Japanese defenders out of some fixed positions. He then attacked alone with just his pistol and a grenade, destroying another enemy strongpoint. As Sergeant Cole was returning to his squad for more grenades and ammunition and to rally his Marines, an enemy grenade killed him. Citation: For conspicuous gallantry and intrepidity at the risk of his life above and beyond the call of duty while serving as leader of a Machinegun Section of Company B, 1st Battalion, 23d Marines, 4th Marine Division, in action against enemy Japanese forces during the assault on Iwo Jima in the Volcano Islands, 19 February 1945. Assailed by a tremendous volume of small-arms, mortar and artillery fire as he advanced with 1 squad of his section in the initial assault wave, Sgt. Cole boldly led his men up the sloping beach toward Airfield No. 1 despite the blanketing curtain of flying shrapnel and, personally destroying with hand grenades 2 hostile emplacements which menaced the progress of his unit, continued to move forward until a merciless barrage of fire emanating from 3 Japanese pillboxes halted the advance. Instantly placing his 1 remaining machinegun in action, he delivered a shattering fusillade and succeeded in silencing the nearest and most threatening emplacement before his weapon jammed and the enemy, reopening fire with knee mortars and grenades, pinned down his unit for the second time. Shrewdly gauging the tactical situation and evolving a daring plan of counterattack, Sgt. Cole, armed solely with a pistol and 1 grenade, coolly advanced alone to the hostile pillboxes. Hurling his 1 grenade at the enemy in sudden, swift attack, he quickly withdrew, returned to his own lines for additional grenades and again advanced, attacked, and withdrew. With enemy guns still active, he ran the gauntlet of slashing fire a third time to complete the total destruction of the Japanese strong point and the annihilation of the defending garrison in this final assault. Although instantly killed by an enemy grenade as he returned to his squad, Sgt. Cole had eliminated a formidable Japanese position, thereby enabling his company to storm the remaining fortifications, continue the advance, and seize the objective. By his dauntless initiative, unfaltering courage, and indomitable determination during a critical period of action, Sgt. Cole served as an inspiration to his comrades, and his stouthearted leadership in the face of almost certain death sustained and enhanced the highest tradition of the U.S. Naval Service. He gallantly gave his life for his country. 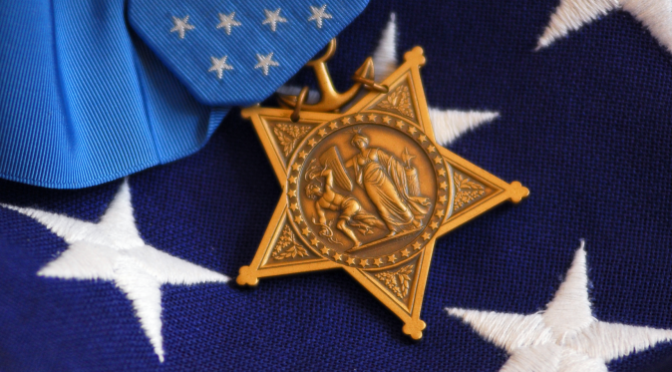 Cole’s Medal of Honor was presented to his widow on April 17, 1947. He was originally buried in the 4th Marine Division cemetery on Iwo Jima. Cole’s remains were exhumed and returned home, where today he rests in peace in the Parkview Cemetery, Farmington, Missouri. The United States Navy honored the memory of their fallen Marine comrade by naming the Arleigh Burke-class destroyer USS Cole (DDG-67) for him. The Cole was severely damaged by an Al Qaeda suicide boat bomb at Aden, Yemen on October 12, 2000 with the loss of 17 killed and 39 wounded. The Cole was repaired and returned to service and today sails from Naval Station Norfolk in Virginia. 1st Battalion 23rd Marines persists as a component of Marine Forces Reserve and the 4th Marine Division. The battalion is comprised of reserve Marines from Louisiana and Texas.